With more than 25 years of solid experience in manufacturing industrial memory and storage solutions, ATP is a trusted name among leading businesses worldwide. Automotive, Health Care, Telecom, IoT, Aerospace/Avionics, and various industries rely on ATP to deliver reliable, durable and high-performance solutions for mission-critical applications. We pride ourselves in being at the forefront of the latest memory and storage manufacturing technologies, offering unique features and value- added solutions that safeguard data integrity, deliver reliable performance and prolong usage to maximize your investment. Our top-of-the-line engineering support capabilities enable us to meet your customization requirements. We also offer OEM joint validation programs. Consider our lab your lab. ATP’s strategic partnership with Micron Technology, Inc. under the Product Longevity Program (PLP) ensures long-term bill of materials (BOM) stability for DRAM and NAND flash storage products. Proactive supply chain disaster recovery planning involves dual-sourcing strategy to ensure supply stability. We implement controlled BOM to guarantee long product cycles with buffer inventory, making sure that any changes affecting the process or product, as well as product end of l ife, are communicated to you. Our products undergo rigorous testing to ensure high performance and longevity in the most demandingenterprise and industrial environments. Testing capabilities range from IC level to ensure die reliability; module level covering design and layout, controller hardware and firmware validation,and OEM customer joint validation for new devices and modules to ensure complete module functionality; and, mass production level Rapid Diagnostic Test (RDT) to establish 100% proven reliability at MP scale. 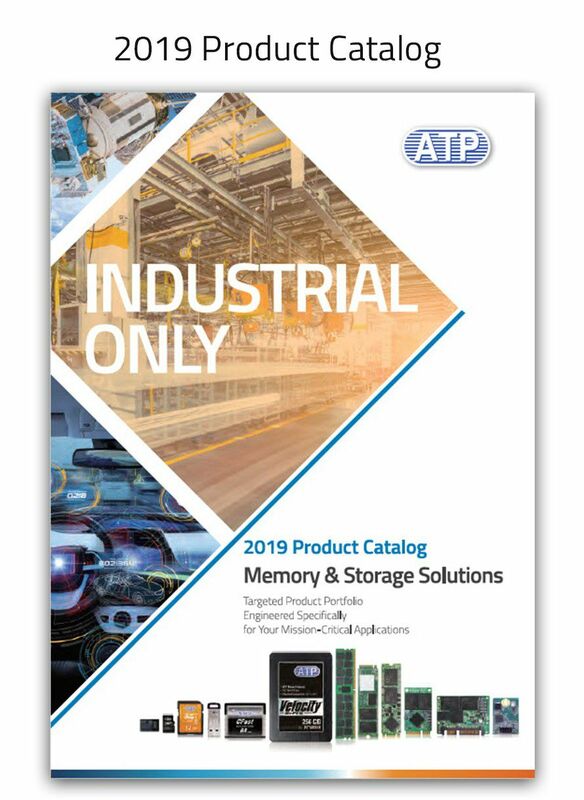 ATP memory and storage modules are manufacturedat ATP’s own facilities and feature exceptional technologies for the most challenging applications and environments. As a true manufacturer, we maintain complete control of our supply and value chains, enabling us to offer the finest products and most extensive range of services to our clients. We at ATP take charge of all the stages of the manufacturing process from materials sourcing all the way to mass production to make sure that all products coming out of our manufacturing facilities are consistently backed by the assurance of quality and long-term product cycles. At the core of our process ownership is the goal to provide customers the highest quality of products and services. By maintaining control of the base stages of the manufacturing process, we are able to manage every critical phase to ensure that components are evaluated, tested and validated with the utmost care. This gives us the unique advantage and flexibility to meet customers' specific requirements as well as the solid confidence of the ATP name. We also implement controlled bill of materials (BOM) with longevity planning. We maintain buffer inventory to prevent stock outs, ensuring steady access to valuable, often scarce resources. Any changes affecting the process or product, as well as product end of life, are communicated to our clients. We work together to forecast demand, enabling efficient supply planning and management. All our products are designed, produced and tested at our own purpose-built factory with state-of-the-art equipment and world-class engineers, allowing us to meet and adapt to customer needs quickly. Our proprietary technologies and resources are available to customers, giving us the unique edge of managing every activity of the manufacturing process to ensure quality and product longevity while significantly restraining costs. For over 25 years, companies around the world have trusted us to provide the best-in-class memory and flash storage products. Their confidence in the ATP name is rooted in our thorough and stringent testing and validation processes, which start from the component level up to the product level. All DRAM and flash storage products go through a series of Functional and Reliability Tests to ensure that they match the specifications agreed upon by ATP and the customer and to ensure that they are compatible with different host environments. We ensure the reliability of the NAND flash via thorough meticulous IC-level validation for reliability and functionality. 100% Rapid Diagnostic Test (RDT) performed during the pilot run ensures proven reliability at mass production (MP) scale. By incorporating additional hardware and software features, ICs can conduct functional and parametric tests on their own. This minimizes dependence on automated test equipment and eliminates the need for an external host or controller, so false failures due to host-related issues are reduced. For NAND flash storage products, the entire drive, including firmware, user and spare areas, is thoroughly tested. DRAM products also undergo complete testing, covering PHY and controller, including meta/mapping and data caching areas. We make sure that products are consistently high in quality and meet all customers’specifications. ATP implements a rating and quality monitoring system, which entails classifying various gradesand establishing proper production-level screening mechanisms to ensure quality.